Therapy is getting quite exhausting. In the group we are going through very intense sessions and I am drained. I also had a session with my individual therapist last Wednesday. What did people do before psychotherapy? When did we start needing to pay people to listen to us? I have been installing Windows 7 on my new Netbook. It works like a charm! 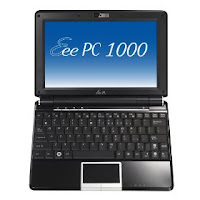 In fact, I am composing this from the newly configured Netbook (which is an Asus eee PC 1000 HE.) I am impressed that the Beta of Windows 7 works so well. To be honest, though Windows 7 is very much like Vista. I am sure that Microsoft is trying to avoid the association, but it is true. Actually, I find Vista after service pack 1 quite easy to use. There are anoyances, but there were annoyances with XP. I am now spoiled by the better graphics in Vista and Windows 7! I went out to a dinner Saturday and needed to dress up a bit. I thought I might wear some sort of pants outfit and did a day of shopping. Though there were many sales and i bought something, I wasn't real happy with what I bought. I covered the large nearby mall. Even Macy's didn't have much. Now my size has changed drastically and I don't shop the Plus Sizes any more, but I am still not in the smaller sizes. There were nice things in size 10 and below, but I am not quite there yet. In desperation I made a quick trip to a Kohl's where I found this darling black cocktail dress. It was so nice I just had to buy it! I am truly seldom in a dress of any sort, but I wore this gladly. I am sorry, but I don;t have any pictures. I honestly didn't think of it. I am back to reading Theoretical Physics again, black holes, quanta, strings and all. I don't know what fascinates me about this stuff. It has no practical application to my life I am sure. I am reading Stephen Hawking again. I need to eat!! It is almost 12:30 and I haven't eaten yet. I am going to leave this and get myself a ridiculously small piece of quiche Lorraine which will totally fill me up. Have a nice day!